The nearest subway stops are the B and D trains at Grand Street, the J train at Bowery, and the F, J, M and Z trains at Delancey-Essex. The Spring Street stop on the 6 train is also convenient about 6 blocks away. Callicoon Fine Arts is very pleased to present a solo exhibition of paintings, works on paper and notebooks by Bracha L. Ettinger. The exhibition follows her participation in the 14th Istanbul Biennial this past autumn and marks a return to New York since her presentation of The Eurydice Series at the Drawing Center in 2001. 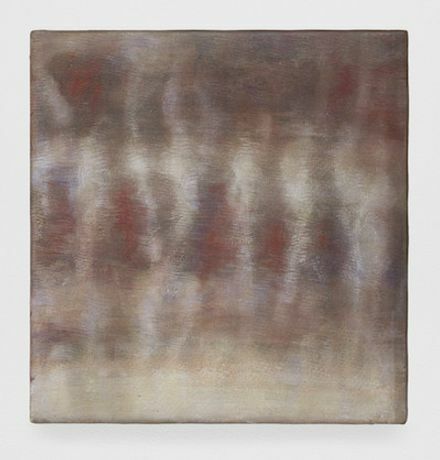 In Bracha’s paintings resonant striations of color, most often blues, violets and reds, are formed from an accumulation of thin lines of oil paint made over several years on each single canvas. Light filled vertical forms are figures simultaneously created by and fused with these horizontal striations. They undulate across the works, screens of intimate size, joining transparent layers of luminosity to shadow, revealing each painting as a space of connectedness and transformation, charged with historical trauma. This reaching between light and dark is thematically articulated in the titles of the works by reference to Eurydice and Medusa, among other figures from mythology and literature. Take for example paintings in the exhibition such as Eurydice nu descendrait (no 1) and Eurydice, The Graces, Medusa: mythological yet still enigmatic figures associated with the feminine, they act to bridge unconscious and historical memory, seeking paradoxical associations between catastrophe and transcendence. The earliest works from The Eurydice series, seen in New York at the Drawing Center, contained fragments of photographs from genocidal Europe of 1942 showing women, mothers and children about to be executed. The photographs have been passed through an interrupted photocopier, making their traces spectral and ghostly. These altered images were then mounted to canvases to become one of the sources of the oil paintings. In some of the more recent work, like Eurydice, the Graces, Medusa and No Title Yet (no 2) presented here, leftovers of such fragmented images are printed directly onto the canvas, appearing and disappearing along with an intensification of the abstract working-through with oil. Like Eurydice descending into the underworld, the image-figures confront their own disappearance, sliding on the color-lines as they dissolve into light and shadow, re-emerging, if only partially, as lively substance. Within this meeting of figurative traces and an abstract research concerning mental visions, the ethical and healing potential of Bracha’s artworks begins to reveal itself. While the works are not abstractions of the devastating historical images, they shuttle abstract “thought-forms” (as revealed by 19th century theosophists) through to the images. For Bracha, abstraction that begins from the mind, enacts from the painting itself a healing transformation that confronts the most difficult atrocities in reality, like that of the Holocaust. Between these incommensurable levels there is an aporia that finds expression in the various dimensions -- of history, of the psyche -- that coexist within each artwork. Petals, rhizomes, bark, ligaments and veins are some of the visual motifs that appear in the works on paper, also shown here. The series, And my heart wound-space with-in me and Chrysalis, show compressed spaces of emergence surrounded by glowing auras in twining folds of transparent color, while the double sided Lichtenberg Flower and Medusa works further elaborate the visual vocabulary. The notebooks, large in number, are a kind of archive incorporating handwriting in French, Hebrew and English that is enmeshed with drawing and doodles, quick jottings bumping against longer elucidations and quotidian necessities. Question marks, strings, arrows, tumbling figures, scattered sensations and thoughts, and notes that express the evolution of her philosophical and psychoanalytical thought, constantly reset the core of Bracha’s idiosyncratic practice.